The end of the government shutdown paves the way for permanent change-of-station moves and professional military education classes to resume. 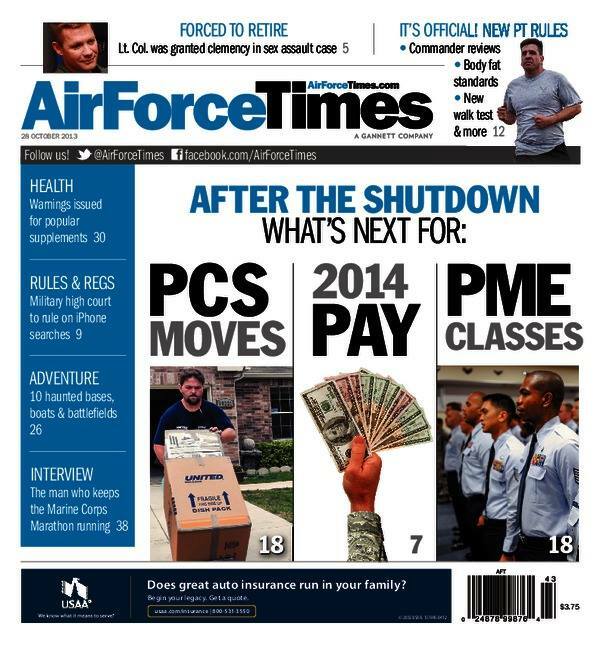 This week’s Air Force Times has more about these issues and how much of a pay raise you can expect next year. Before you brag about how well you did on your last PT test, read about 2nd Lt. Samantha Morrison, the third-fastest nonprofessional female athlete n the world who recently competed in the Ironman World Championships. Also this week, Lt. Gen. Michelle Johnson talks to Air Force Times about being the Air Force Academy’s first female superintendent. Speaking of the Air Force Academy, cadets will be the first to get new Gore-Tex raincoats starting next fall. You can see what the new raincoats look like. And the Air Force could save about $3.5 billion by retiring its entire fleet of A-10s, the service wrote to Sen. Kelly Ayotte, R-N.H. Find out more about why the Air Force would get rid of this famous airplane.